Spanish coal miners came to march in Madrid with helmets on their heads and the worried look of men with no future on their faces. But they were clear that they would not give up on their life-or-death struggle for the future of their collieries. “We’ll keep going and, if nothing happen, the fight will just get harder,” said Jórge Exposito, a helmeted miner from Mieres, northern Spain, as fireworks crackled and twitchy riot police stood by with shields and guns loaded with rubber bullets. A tense standoff saw occasional police charges, rubber bullets and demonstrators hurling objects at police. At least 76 people were injured in clashes along Madrid’s central Castellana Boulevard, but the march on Madrid eventually ended with nothing more violent than a rousing sing-song. The miners had brought with them the dust of Castile, the sun-baked central region of Spain that 200 of them had walked through on their 400 km, three-week march to reach the capital. Many had wept when they were greeted by crowds of supporters in Madrid. Thousands more came in buses that made the long trip from the northern regions of Asturias and Leon or the collieries of eastern Aragon and southern Puertollano. Industry minister José Manuel Soria declined to meet the protesters and the ministry itself was protected with temporary fencing. The miners had arrived in the hope that the centre-right government of Mariano Rajoy could be persuaded to return to a programme of subsidies to mining companies that has been dramatically chopped by 60% this year. Instead, the prime minister devoted the morning to announcing a further austerity package to save the government €65 billion over the next two and a half years. “All we are asking for is that they stick to the agreement,” said Isidro Castro, a former miner from the northern region of Leon. “That is not so difficult. “If the mining companies don’t get their subsidies this year, then there will be nothing to negotiate next year as they will have to close,” he said. Celestino Duran, a miner from the Sant Lucía de Gordón coalfield, said: “Now they can see the support that we have, then maybe they will change. With Spanish unemployment at 24%, few miners believe they can find jobs elsewhere. “I have two children. They are already taking away grants for school and university,” said Celestino Duran. 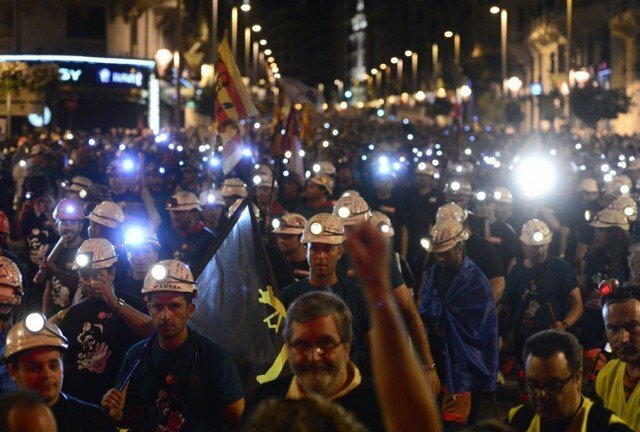 Tens of thousands of people turned out on Tuesday night to greet the miners who, with their helmet lanterns ablaze, strode into the city’s central Puerta del Sol, famous as the centre of Spain’s indignado protest movement. Now many see the miners as in the vanguard of the fight against austerity measures which were made still more drastic on Wednesday and threaten to deepen a double-dip recession. But the government argues that Spain’s coal mines are making losses and European Union rules do not allow it to subsidize them much longer. “We think they should keep the mines running because who knows what might happen to the supplies from other countries?” said Jorge Exposito. “If they suddenly dry up, for whatever reason, Spain will need its own stock of coal. But the chances that their children would also be miners are slim. “The future is as black as coal,” he admitted.